A vibration meter is typically a portable device with a memory for storing measurements. Vibration is most commonly measured using a ceramic piezoelectric sensor accelerometer. An accelerometer is a sensor that measures the dynamic acceleration of a physical device as a voltage. Get the best vibration meter price in Pakistan with free shipping in all the major cities of Pakistan. Here you get reasonable vibration meter price in Pakistan, Karachi, Lahore, Islamabad, Sialkot, Faisalabad, Peshawar, Quetta, Multan, Rawalpindi, and many more cities. FEATURE: Vibration meter(also called also called vibration severity) uses Piezoelectric Accelera..
OVERVIEW:Lutron VB-8201HA is a vibration meter for vibration velocity and acceleration testing. 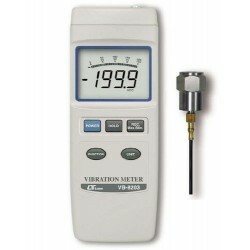 Cons..
OVERVIEW:The Lutron VB-8213 Vibration Meter is a device used to measure the engine vibration level&n..
SPECIFICATION: Measuring PrinciplePiezoelectric Ceramic Accelerometer(shear-type) Accelera.. Features:* Separate professional vibration probe. * Velocity : 200 mm/s. * Acceleration : 200 m/s2. * R.. FEATURES:Professional vibration meter supply with vibration sensor & magnetic base full set.Metr.. Features:* Separate professional vibration sensor. * Velocity : 200 mm/s. * Acceleration : 200 m/s2. * ..
Overview: Digital Pen Type Vibration Meter Lutron PVB-820Features: Pen type Pocket Size in..